where he helps thwart Hookie-the-Goblin. Of course, all this takes place while all the real-for-sure people were away from home or fast aleep! 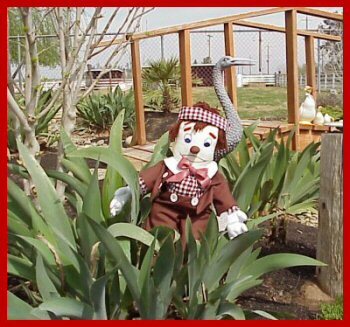 of Gruelle's many storybook character dolls! He gives an added dimension to any collection. 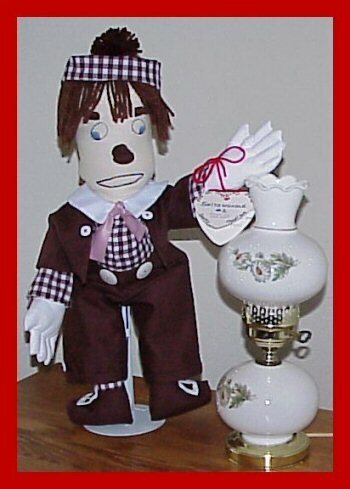 You will simply fall in love with this unusual little character!! 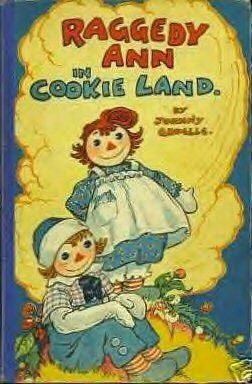 When Raggedy Ann and Andy fall down a deep hole, they find themselves in a magical world called Cookie Land. There they meet Little Weakie, Hookie-the-Goblin, and Mr. and Mrs. Cookie and their two cookie children. It's the Cookie family who award bravery medals to the Raggedys after they save them from one of Hookie's sneak attacks. Then Hookie brings along his friend the Snitznoodle to help him capture the Raggedys, but Snitznoodles don't mess with dolls wearing bravery medals, no siree. Don't worry, though, the Raggedys find a way to make everyone friends and as always, it's a Raggedy-good time in Cookie Land. 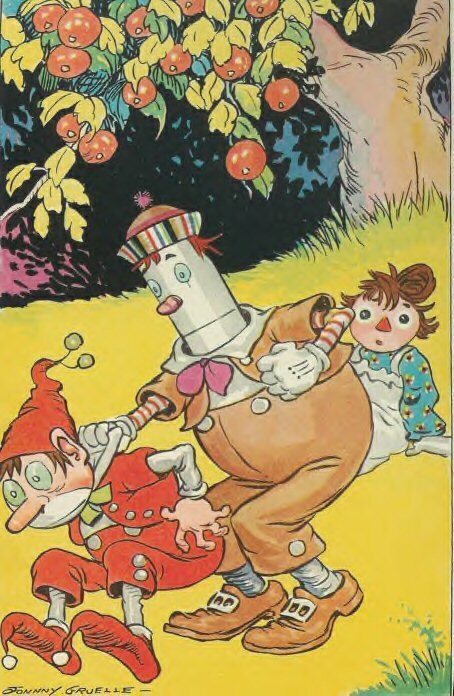 Delight in the scrumptious adventures of the ever-lovable Raggedys in another of Johnny Gruelle's wondrous storybooks. 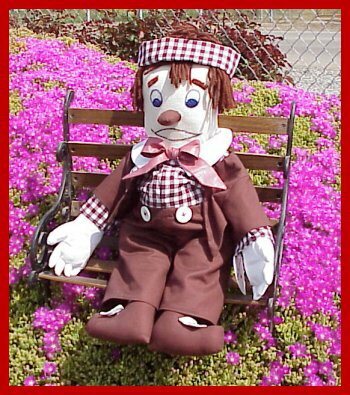 Full of funny, curious, and "kookie" creatures, this delectable Raggedy Ann classic will have you chuckling with every turn of the page. 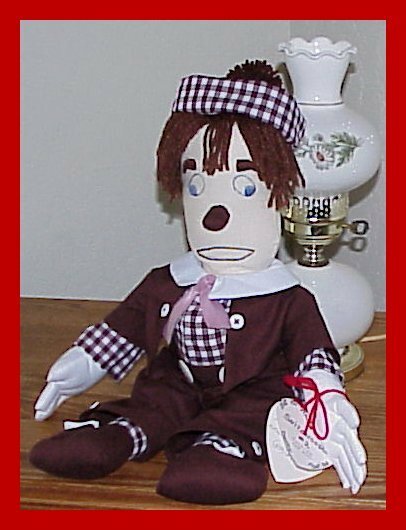 First published in 1931 and restored to its original condition, Raggedy Ann in Cookie Land, now back in print, is a treat for all ages. with white peter pan collar. 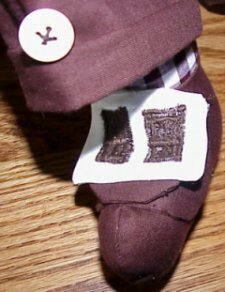 and brown shoes with big white fabric buckles. (on his fat little tummy), and small white buttons on each "cuffed" leg. A mauve colored "tie" adds the final touch! 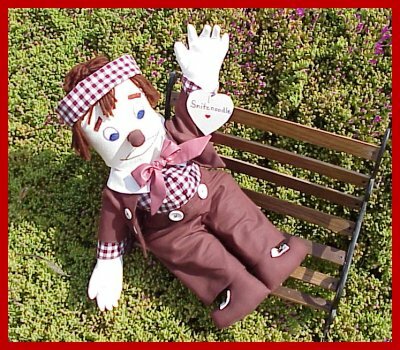 He is a real charmer and is fast becoming a very sought after character doll ! is hand-stitched piece by piece. 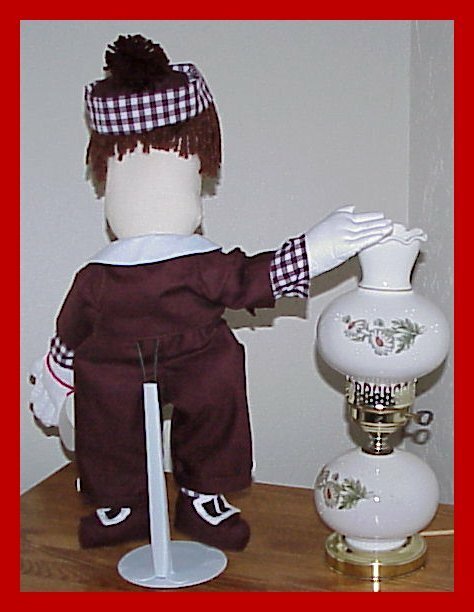 He has side-facing legs with the traditional red/white stripes and brown/white checked socks.
. therefore, each will add that one-of-a-kind distinction to your collection! The top row are my "Current" Snitznoodle dolls....the bottom row is my first "prototype" doll.